Newcastle made it their best start to a season in 17 years with victory over Wolves at Molineux. Demba Ba scored his fourth goal in two games when he headed in Yohan Cabaye's corner at the near post. Argentine midfielder Jonas Gutierrez added a superb second when he surged past four challenges to fire in low. Steven Fletcher headed in for Wolves late on, who were denied a penalty and what appeared to be a legitimate equaliser in stoppage time. 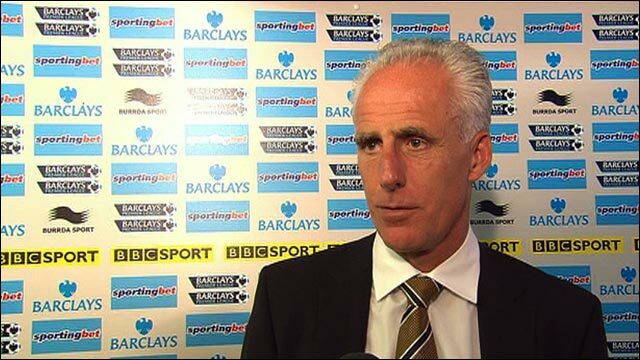 Wolves boss Mick McCarthy will rightly be aggrieved by those two decisions. The first was made by referee Mark Halsey who judged Steven Taylor's foul on Jamie O'Hara to have been outside the area when it was inside, and the second was made by the assistant referee who deemed Adam Hammill's cross to have gone behind before it was headed back for Kevin Doyle to net. McCarthy will point to their bad luck but the statistics now show that Wolves have lost four league matches and have claimed one point from a possible 15 - so it may prove to be another difficult season for the Midlands side. In contrast, the Newcastle juggernaut rolls on. Newcastle are unbeaten in their last 10 PL games. The previous time they went 10 games unbeaten in the top flight was August 1997. The Magpies are unbeaten and enjoying their best run since 1994, although few would have thought the class of 2011 would come close to emulating their ancestors. Alan Pardew's current squad has been put together with a relatively low budget but the resolve and unity within the team is priceless. Another surprise is that Newcastle have the meanest defence in all four leagues and they did their utmost to preserve the tag at Molineux. Young Dutch keeper Tim Krul saw his value rocket up with a sensational display. He dived low to stop O'Hara's free-kick from swinging in before twice saving from Doyle. But his Hollywood moment came in the second half when his double save denied Fletcher and Hammill. For all of Newcastle's braveheart efforts, Wolves were also guilty of profligacy with Fletcher and Doyle wasting chances when in good positions. The visitors attacking unit played their part too. They looked pacy and powerful in attack and opened the scoring when Ba scored his fourth goal in two games when he headed in Cabaye's corner from the left. Newcastle extended their advantage seven minutes before half-time when Gutierrez went on a mazy run before slotting in. Minutes later Wolves were denied a penalty which could have brought them back into the game. Fletcher did give his side hope with three minutes remaining when he scored from Hammill's cross, but another dubious decision denied them a deserved equaliser. It was Hammill again who swung the ball to the far post which was nodded back by Matt Jarvis for Doyle to covert. The Wolves players ran away to celebrate only for the party to be halted by the assistant's flag. "Bad decisions have cost us, but poor defending has cost us first and foremost. "When you're having a tough time you need the right decisions to go your way. It doesn't help our cause does it? "We were wasteful in front of goal and had enough chances in the second half to win the game." On the decision not to award a penalty: "I spoke to Mark [referee Halsey] and he said he didn't want to guess. It didn't require a guess because it was in the area. 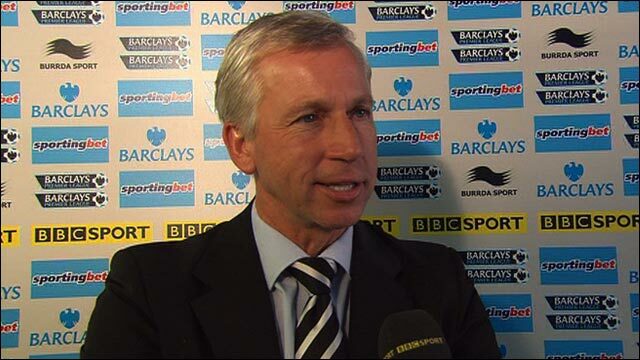 "I could just point fingers at everyone else but we conceded poor goals." "We were lucky today. Wolves were very, very good and off the back of two home defeats they weren't going to give in. "Perhaps deserved a point at the very least. In the first half we showed we had quality in this team and in the second half we showed we had the spirit to hang on. "We've been better than that and controlled the game much better in other matches. Today we had good fortune and did play well at times." 90:00+5:55 The game is over, as the referee blows his whistle. 90:00+5:34 Inswinging corner taken from the right by-line by Jamie O'Hara, clearance made by Fabricio Coloccini. 90:00+5:19 Steven Fletcher takes a shot. Ryan Taylor gets a block in. 90:00+4:26 Leon Best takes a shot. Richard Stearman gets a block in. 90:00+2:44 Matthew Jarvis fouled by Jonas Gutierrez, the ref awards a free kick. The ball is sent over by Jamie O'Hara, Headed effort from deep inside the penalty area by Roger Johnson goes harmlessly over the crossbar. 90:00+2:17 The ball is crossed by Stephen Ward, clearance made by Jonas Gutierrez. 90:00+1:45 Booking Tim Krul goes into the book. 90:00+1:03 Substitution Sylvain Marveaux replaces Gabriel Obertan. 89:46 Adam Hammill produces a cross, save by Tim Krul. 88:21 Substitution Danny Guthrie is brought on as a substitute for Yohan Cabaye. 87:02 Assist on the goal came from Adam Hammill. 87:02 GOAL - Steven Fletcher:Wolverhampton 1 - 2 Newcastle Steven Fletcher finds the net with a headed goal from inside the six-yard box. Wolverhampton 1-2 Newcastle. 86:45 Volleyed left-footed shot by Jamie O'Hara. Steven Taylor gets a block in. 85:10 Peter Lovenkrands is flagged offside by the assistant referee. Wayne Hennessey restarts play with the free kick. 84:29 Adam Hammill produces a right-footed shot from the edge of the box and misses to the right of the target. 84:15 A cross is delivered by Matthew Jarvis. 83:25 Corner taken by Yohan Cabaye from the left by-line played to the near post, Kevin Doyle makes a clearance. 81:10 Steven Taylor is flagged offside by the assistant referee. Wayne Hennessey takes the indirect free kick. 79:51 Foul by Roger Johnson on Leon Best, free kick awarded. Ryan Taylor takes the free kick. 79:00 The ball is delivered by Matthew Jarvis, Header from close in by Steven Fletcher misses to the right of the goal. 78:33 Inswinging corner taken left-footed by Jamie O'Hara from the right by-line, save by Tim Krul. 76:27 Matthew Jarvis gives away a free kick for an unfair challenge on Steven Taylor. Tim Krul restarts play with the free kick. 76:03 Free kick awarded for an unfair challenge on Jamie O'Hara by Cheik Tiote. Jamie O'Hara restarts play with the free kick. 75:49 Unfair challenge on Christophe Berra by Leon Best results in a free kick. Free kick taken by Christophe Berra. 75:02 Effort from deep inside the area by Roger Johnson misses to the left of the target. 74:34 Foul by Peter Lovenkrands on Jamie O'Hara, free kick awarded. Direct free kick taken by Jamie O'Hara. 72:00 Adam Hammill crosses the ball. 71:14 Kevin Doyle takes a shot. Blocked by Cheik Tiote. 70:11 Substitution Demba Ba leaves the field to be replaced by Peter Lovenkrands. 67:24 Foul by Adam Hammill on Jonas Gutierrez, free kick awarded. Tim Krul takes the free kick. Correction - 67:08 Jamie O'Hara takes a shot. Save by Tim Krul. 65:50 Jamie O'Hara takes a shot. Save made by Tim Krul. 65:41 Steven Fletcher takes a shot. Save made by Tim Krul. 65:31 Matthew Jarvis takes a shot. Tim Krul makes a save. 64:13 Effort from inside the area by Demba Ba misses to the right of the target. 62:28 The ball is delivered by Matthew Jarvis. 61:18 Jamie O'Hara delivers the ball, Shot from inside the area by Steven Fletcher clears the bar. 58:23 Centre by Adam Hammill, Jamie O'Hara has an effort at goal from just outside the area which goes wide of the left-hand post. 57:06 Substitution Adam Hammill is brought on as a substitute for Karl Henry. 57:06 Substitution Adlene Guedioura joins the action as a substitute, replacing Stephen Hunt. 56:48 Kevin Doyle takes a shot from deep inside the box clearing the bar. 55:53 Leon Best is caught offside. Wayne Hennessey takes the free kick. 55:08 Inswinging corner taken from the right by-line by Jamie O'Hara, save made by Tim Krul. 54:21 Demba Ba produces a cross. 53:03 Jonas Gutierrez has an effort at goal from outside the box which goes wide left of the goal. 52:08 Booking Jonas Gutierrez receives a caution. 52:00 Jonas Gutierrez gives away a free kick for an unfair challenge on Richard Stearman. Karl Henry takes the direct free kick. 51:12 The assistant referee flags for offside against Steven Fletcher. Tim Krul takes the indirect free kick. 50:44 Kevin Doyle fouled by Gabriel Obertan, the ref awards a free kick. Jamie O'Hara takes the direct free kick. 49:29 Steven Fletcher has an effort at goal from outside the box which goes wide right of the target. 47:49 A cross is delivered by Matthew Jarvis. 47:21 Jamie O'Hara takes the outswinging corner, clearance made by Gabriel Obertan. 45:26 Cheik Tiote challenges Karl Henry unfairly and gives away a free kick. Jamie O'Hara crosses the ball from the free kick left-footed from left wing, clearance made by Ryan Taylor. 45:01 The second half has started. 45:00+2:45 The first half comes to an end. 45:00+1:36 Unfair challenge on Kevin Doyle by Steven Taylor results in a free kick. Free kick taken by Jamie O'Hara. 45:00+0:41 The ball is crossed by Gabriel Obertan. 42:36 Steven Fletcher challenges Fabricio Coloccini unfairly and gives away a free kick. Tim Krul takes the direct free kick. 42:27 Matthew Jarvis delivers the ball, clearance by Steven Taylor. 42:22 Stephen Ward crosses the ball, clearance made by Steven Taylor. 42:00 Matthew Jarvis produces a cross, Fabricio Coloccini makes a clearance. 41:05 Jamie O'Hara takes a shot. Save by Tim Krul. Corner taken left-footed by Jamie O'Hara. 40:12 Free kick awarded for an unfair challenge on Jamie O'Hara by Steven Taylor. Matthew Jarvis restarts play with the free kick. 39:28 Matthew Jarvis has an effort at goal from outside the area which goes wide left of the target. 38:40 Booking Karl Henry receives a yellow card for unsporting behaviour. 37:13 GOAL - Jonas Gutierrez:Wolverhampton 0 - 2 Newcastle Jonas Gutierrez gets on the score sheet with a goal from the edge of the penalty area to the bottom right corner of the goal. Wolverhampton 0-2 Newcastle. 35:58 Shot from just outside the box by Kevin Doyle misses to the right of the target. 35:05 Demba Ba produces a left-footed shot from the edge of the box and misses to the right of the target. 33:59 Jamie O'Hara takes a shot from just inside the penalty box which clears the crossbar. 32:15 The ball is sent over by Stephen Hunt, clearance by Cheik Tiote. 31:44 Corner taken right-footed by Matthew Jarvis from the left by-line, clearance by Leon Best. 31:04 Jonas Gutierrez takes a shot. Save by Wayne Hennessey. 29:59 Centre by Danny Simpson, Roger Johnson manages to make a clearance. 29:19 The ball is swung over by Cheik Tiote, Richard Stearman manages to make a clearance. 28:30 Shot from 25 yards by Cheik Tiote. Save by Wayne Hennessey. Inswinging corner taken by Yohan Cabaye from the left by-line. 28:00 Inswinging corner taken left-footed by Stephen Ward, clearance made by Fabricio Coloccini. 27:26 Corner taken by Jamie O'Hara from the left by-line, Fabricio Coloccini makes a clearance. 26:16 The assistant referee signals for offside against Leon Best. Indirect free kick taken by Wayne Hennessey. 25:36 Unfair challenge on Steven Taylor by Kevin Doyle results in a free kick. Tim Krul restarts play with the free kick. 25:10 A cross is delivered by Danny Simpson. 24:19 Kevin Doyle is ruled offside. Free kick taken by Tim Krul. 22:39 Inswinging corner taken left-footed by Jamie O'Hara from the right by-line, Christophe Berra produces a left-footed shot from close in that goes over the bar. 22:33 The ball is sent over by Matthew Jarvis, clearance by Steven Taylor. 22:09 The ball is crossed by Jonas Gutierrez. 20:54 Floated corner taken from the right by-line by Yohan Cabaye. 20:38 Leon Best takes a shot. Christophe Berra gets a block in. 19:48 Kevin Doyle takes a shot. Steven Taylor gets a block in. Matthew Jarvis takes a shot. Save made by Tim Krul. Corner taken by Jamie O'Hara from the left by-line. 16:17 Yohan Cabaye provided the assist for the goal. 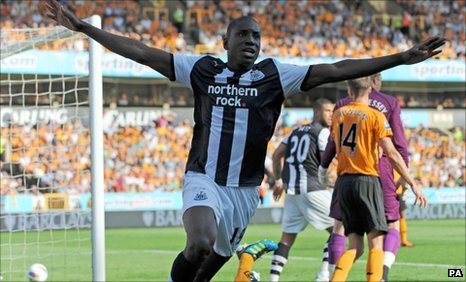 16:17 GOAL - Demba Ba:Wolverhampton 0 - 1 Newcastle Demba Ba finds the back of the net with a headed goal from close range. Wolverhampton 0-1 Newcastle. 14:54 Danny Simpson produces a cross, save by Wayne Hennessey. 13:24 Effort from the edge of the box by Jonas Gutierrez goes wide of the right-hand upright. 12:24 Kevin Doyle takes a shot. Save by Tim Krul. 11:28 Unfair challenge on Leon Best by Christophe Berra results in a free kick. Cheik Tiote takes the free kick. 10:38 Short corner worked by Yohan Cabaye, clearance made by Karl Henry. 9:47 The referee gives a free kick against Matthew Jarvis for handball. Direct free kick taken by Ryan Taylor. Correction - 9:17 A cross is delivered by Matthew Jarvis, Effort on goal by Kevin Doyle from 12 yards. Save by Tim Krul. 9:17 A cross is delivered by Matthew Jarvis, Kevin Doyle has an effort at goal from deep inside the area missing to the right of the goal. 8:29 The ball is sent over by Demba Ba, clearance made by Roger Johnson. 7:36 Jamie O'Hara delivers the ball, Headed effort from deep inside the penalty area by Steven Fletcher misses to the left of the goal. Correction - 4:59 The official flags Leon Best offside. Indirect free kick taken by Wayne Hennessey. 4:59 The offside flag is raised against Leon Best. Wayne Hennessey restarts play with the free kick. 4:23 The referee blows for offside against Steven Fletcher. Tim Krul takes the indirect free kick. 3:56 Demba Ba is flagged offside by the assistant referee. Indirect free kick taken by Wayne Hennessey. 2:34 The official flags Demba Ba offside. Free kick taken by Wayne Hennessey. 2:01 Steven Fletcher gives away a free kick for an unfair challenge on Danny Simpson. Steven Taylor takes the direct free kick. 1:08 Steven Fletcher fouled by Ryan Taylor, the ref awards a free kick. The free kick is delivered left-footed by Jamie O'Hara from right channel, save by Wayne Hennessey. 0:51 The official flags Leon Best offside. Wayne Hennessey takes the free kick. 0:26 A cross is delivered by Kevin Doyle, clearance by Ryan Taylor. Live text and data provided by The Press Association.